Summer means insect bites. If you live in Florida like I do, all you have to do is step outside for five minutes and you’ll come back full of bug bites. Most of the time bug bites aren’t serious. Most bug bites and stings this time of year are quite harmless and can be treated easily. However, this is not always the case, and there are some instances where your insect bite may need medical attention. Below you’ll find some signs that perhaps your bug bite may need more than tea tree oil. Sometimes insect bites can get infected. This is especially true if you or your child suffer from an autoimmune disease. If you’re concerned about being susceptible to infection, make sure to wash the area with soap and water. Once the bite is washed, wipe the area with rubbing alcohol and antiseptic. You’ll also want to avoid scratching as much as you can—especially in children. If the area around your insect bite grows in size, becomes painful or drains pus, then there’s a good chance it’s infected. More serious infections that may require the help of antibiotics include low grade fever, severe swelling and worsening redness. Sometimes people are allergic to insect bites and don’t even know it. This can range from swelling in the area to anaphylactic shock. Since many people don’t know if they have an allergy to a particular insect bite, it’s important to know the symptoms and if they require a visit to the emergency room. If you’re sensitive to insect bites you may see some swelling and blistering around the area. It’s important to note that swelling in this case does not exceed 10 centimeters, as that may be a sign of something more serious. More serious allergic reactions include difficulty breathing, swelling of the lips, eyelids or throat, nausea, diarrhea, cramps, hives and rapid heartbeat. If you experience any of these things after being bitten by an insect, seek emergency attention. In the time it takes to get to the ER, Mayo Clinic recommends loosening tight clothing, turning the person on their side to prevent choking and injecting an epinephrine auto injector if the person is carrying one. Insects can be carriers of diseases such as West Nile Virus as well as other diseases we may not be prepared to deal with. Earlier this year 11 people in Florida were infected via mosquito bites with Chikungunya which causes debilitating joint pain and swelling. Below you’ll find some of the disease cases in the U.S. and their symptoms. 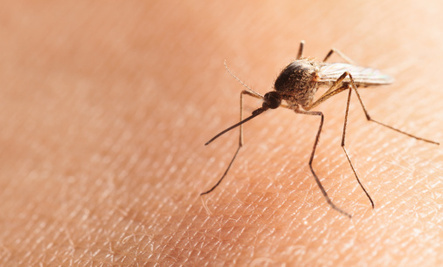 Malaria – Malaria often doesn’t show signs until weeks after the bite. This can include recurring high fever, vomiting, chills and diarrhea. West Nile Virus – The problem with West Nile Virus is that 70 to 80 percent of people don’t show symptoms. About 1 in 5 people will develop fatigue, fever, body aches, join pain and rash. For the rare 1 percent of people infected with West Nile Virus, they may experience severe neurological issues like meningitis. Dengue Fever – This rarely occurs in the U.S. but when it does it’s usually because of a mosquito. Symptoms include high fever, headache, pain behind the eyes and nosebleeds. Symptoms usually appear within 4 to 6 days after being bitten. If you feel symptoms for any of these diseases, make sure to seek immediate medical attention. Most people recover just fine with the proper medical care. The baseball bat marks from trying to kill the damn thing is probably the first clue. Scratching off one's skin to the bone is the second.